CATALOG DESCRIPTION: Principles and applications of metadata for digital resource representation and retrieval using various schemes. Includes metadata creation, management, and dissemination, especially for digital libraries. 3 credits. OBJECTIVES/OUTCOMES: Upon completion of the course, students will be able to: 1. Articulate important concepts, issues, and terminology related to metadata theory, standards, and applications relevant to cultural heritage institutions; 2. Analyze and critically apply different approaches to metadata creation, storage, management, and dissemination within different information communities for different purposes; 3. Critically analyze and compare different metadata standards and their applicability to different contexts; 4. Create descriptive metadata for digital resources using selected metadata structure, content, value, and encoding standards; 5. Design and document metadata schemes and application profiles to meet the functional requirements of specific collections, projects, organizations, and communities; 6. Apply basic metadata quality metrics to evaluate the quality, interoperability, and shareability of different types of descriptive metadata; 7. Be equipped with knowledge and skills relevant to entry-level metadata librarian and metadata specialist positions in cultural heritage organizations. METHOD: Online content and video presentations/lectures, learning exercises, discussions. Students with special test and note-taking needs should contact the instructor as early as possible for accommodations. See policies below. TEXTS, READINGS, AND RESOURCES: REQUIRED for Fall 2013: Miller, Steven J. 2011. Metadata for Digital Collections: A How-To-Do-It Manual. New York: NealSchuman, 2011. ISBN: 978-1555707460. 10% discount for students ordering from publisher’s website. ADDITIONAL RECOMMENDED TEXT (NOT REQUIRED): Zeng, Marcia Lei & Jian Qin. 2008. Metadata. New York: Neal-Schuman. ISBN: 9781555706357. ADDITIONAL REQUIRED OR RECOMMENDED READINGS: Various technical standards documents, to be specified for course units as applicable (e.g., for Dublin Core, MODS, VRA, controlled vocabularies, metadata application profiles, etc.) ANSI/NISO Z39.19-2005. Guidelines for the Construction, Format, and Management of Monolingual Controlled Vocabularies. Section 5 (p. 10-20). Available online and posted on the course site. Ardö, Anders. 2010. "Can We Trust Web Page Metadata?" Journal of Library Metadata 10, no. 1: 58-74. Posted on the course site. Baca, Murtha, et al. 2008. “Practical Principles for Metadata Creation and Maintenance.” In: Baca, Murtha. Introduction to Metadata. Second Edition. Los Angeles: Getty Research Institute. Online edition: http://www.getty.edu/research/publications/electronic_publications/intrometadata/principles.html Baker, Thomas. 2012 "Libraries, languages of description, and linked data: a Dublin Core perspective." Library Hi Tech, Vol. 30 Issue 1, p. 116-133. Posted on the course site. Chopey, Michael A. 2005. “Planning and Implementing a Metadata-Driven Digital Repository.” In Metadata: A Cataloger's Primer, edited by Richard P. Smiraglia, 255-287. Binghamton, NY: Haworth Press. Available on the course site. Croissant, Charles R. 2012. "FRBR and RDA: What They Are and How They May Affect the Future of Libraries." Theological Librarianship 5:2 (July). https://journal.atla.com/ojs/index.php/theolib/article/viewFile/234/565 Doerr, Martin, et al. 2010. "The Europeana Data Model (EDM)." World Library and Information Congress: 76th IFLA General Conference And Assembly, 10-15 August 2010, Gothenburg, Sweden. Stewart, Darin L. 2008. Building Enterprise Taxonomies. Mokita Press. Chapter 8: "Ontology" (p. 162-192). Posted on the course site. Whalen, Maureen. 2008. “Rights Metadata Made Simple.” In: Baca, Murtha (editor). Introduction to Metadata. Second Edition. Los Angeles: Getty Research Institute. Online edition, Version 3.0: http://www.getty.edu/research/publications/electronic_publications/intrometadata/rights.pdf Zeng, Marcia Lei & Jian Qin. 2008. Metadata. New York: Neal-Schuman. Chapters 2 and 9. To be posted on the course site. Introduction to metadata for digital collections. Introduction to digital resource description. Introduction to Dublin Core. Resource ID & responsibility metadata. Resource content and relationship metadata. Subject analysis and representation. Controlled vocabularies for resource discovery. XML-encoded metadata. OAI metadata harvesting. OAI DC XML; MODS XML. MODS: Metadata Object Description Schema. Mapping between DC and MODS. oXygen; XML schemas, file validation, XSLT. Spectrum of metadata schemes. Metadata for humanities, education, science. Archives metadata: EAD. Library metadata: MARC, MARCXML, FRBR, RDA. MarcEdit. Museum metadata: VRA, CCO, CDWA. Books & media: ONIX, IPTC/XMP, MPEG, etc. Metadata in e-commerce, e-government. Digital asset management (DAM). IA & UXD. Metadata interoperability, shareability, OAI harvesting, quality. Google Refine. Miller ch. 9; Jackson, et al. ; Shreeves et al. Designing and documenting a metadata scheme. Application profiles. Administrative, preservation, rights, and structural metadata; METS. Ethics and diversity in metadata. Metadata and the Web. Metadata research. Abbreviated citations to required readings in this schedule refer to complete citations given in the list of readings above. *Tech docs = technical documents such as user guides, formal specifications, metadata application profiles, etc. **MAPs = Metadata application profiles Additional recommended readings and resources will be given at the start of each weekly unit. All of the required readings for the semester are listed above. EXERCISES (Pass/Fail): Exercise 1: Digital resource description with Dublin Core and controlled vocabularies. Exercise 2: XML metadata; MODS metadata; mapping from Dublin Core to MODS. Exercise 3: Metadata design and documentation; quality assessment. ASSIGNMENTS (Graded): Assignment 1: Includes the creation of Dublin Core metadata following the specifications in a provided application profile. Students will express the descriptive and subject content of digital objects using the Dublin Core metadata element scheme, which involves understanding the semantic meaning of the 15 Dublin Core elements, the use of the DC refinement and encoding scheme qualifiers, and the application of selected controlled vocabulary standards to metadata element values. Assignment 2: Includes creating one or more original MODS records in XML, using XML editing software and validating MODS XML files against the MODS XML Schema, and mapping between MODS and Dublin Core. The assignment ensures that students understand the syntax, structure, and semantics of a hierarchical, XML-based metadata scheme, including parent and child elements and sub-elements, and the use of element attributes and controlled vocabularies, using MODS as a concrete example, as well as issues involved in mapping among diverse metadata schemes or element sets, and also how to work with XML editing software. Assignment 3: Each student may choose to do either a metadata design project or a research paper for the third graded assignment, as outlined below. Assignment 3: Option 1: Metadata Application Profile Design Project. Entails designing a complete metadata scheme for an original metadata application scenario of each student's invention. This will include a description of the organizational and/or subject domain context, the digital content, and the envisioned users; a list of functional requirements for browsing, searching/limiting, and identifying the content, including faceted navigation; a summary application profile table listing local, collection-specific metadata elements, mappings to Dublin Core and MODS, designated vocabularies and other schemes, obligation, cardinality, input guidelines, and examples for each element; and set of 8-10 metadata records conforming to the application profile. The project might also include one or two additional components, as covered in the course content and exercises. The project will bring together aspects of metadata covered during the course as a whole and give students practical experience in metadata design and documentation. Assignment 3: Option 2: Research Paper. Investigate a significant research issue or problem related to metadata, and write a paper on the issue, using at least 8-10 scholarly and professional sources (primarily journal articles). The paper will include two primary components: 1. Summarize the issue/problem, the research results and/or points and conclusions of the authors, and your own final assessment and comments on these. 2. Formulate ideas for a hypothetical research project of your own that would contribute to scholarly knowledge in this area. Formulate the research problem; select a research method for addressing it; include a bibliography of sources you would use for a literature review; list journals in which you might publish your research. • Paper requirements: o 10-12 double-spaced pages, excluding cover page and end notes, 12 point Times New Roman Font, 1 inch margins. Students in the Information Organization (IO) Concentration must earn a final grade of B or higher in order to have this course count towards their concentration requirements. Metadata Course Syllabus Page 7 of 8 Note on the grading scale: Neither UWM nor SOIS has a single uniform grading scale. Although many instructors choose to use a similar scale, any instructor may determine a scale best suited to his or her particular assessment methods. UWM AND SOIS ACADEMIC POLICIES: The following links contain university policies affecting all SOIS students. Many of the links below may be accessed through a PDF-document maintained by the Secretary of the University: http://www.uwm.edu/Dept/SecU/SyllabusLinks.pdf. Undergraduates may also find the Panther Planner and Undergraduate Student Handbook useful (http://www4.uwm.edu/osl/students/). For graduate students, there are additional guidelines from the Graduate School (http://www.graduateschool.uwm.edu/students/current/), including those found in the Graduate Student and Faculty Handbook: http://www.graduateschool.uwm.edu/students/policies/expanded/. Students with disabilities. If you will need accommodations in order to meet any of the requirements of a course, please contact the instructor as soon as possible. Students with disabilities are responsible to communicate directly with the instructor to ensure special accommodation in a timely manner. There is comprehensive coverage of issues related to disabilities at the Student Accessibility Center ( http://www4.uwm.edu/sac/ ), important components of which are expressed here: http://www.uwm.edu/Dept/DSAD/SAC/SACltr.pdf. Religious observances. Students’ sincerely held religious beliefs must be reasonably accommodated with respect to all examinations and other academic requirements, according to the following policy: http://www4.uwm.edu/secu/docs/other/S1.5.htm. Please notify your instructor within the first three weeks of the Fall or Spring Term (first week of shorter-term or Summer courses) of any specific days or dates on which you request relief from an examination or academic requirement for religious observances. Students called to active military duty. UWM has several policies that accommodate students who must temporarily lay aside their educational pursuits when called to active duty in the military (see http://www4.uwm.edu/academics/military.cfm), including provisions for refunds, readmission, grading, and other situations. Metadata Course Syllabus Page 8 of 8 Incompletes. A notation of “incomplete” may be given in lieu of a final grade to a student who has carried a subject successfully until the end of a semester but who, because of illness or other unusual and substantial cause beyond the student’s control, has been unable to take or complete the final examination or some limited amount of other term work. 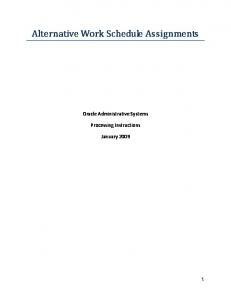 An incomplete is not given unless the student proves to the instructor that s/he was prevented from completing course requirements for just cause as indicated above (http://www4.uwm.edu/secu/docs/other/S31.pdf). Discriminatory conduct (such as sexual harassment). UWM and SOIS are committed to building and maintaining a campus environment that recognizes the inherent worth and dignity of every person, fosters tolerance, sensitivity, understanding, and mutual respect, and encourages the members of its community to strive to reach their full potential. The UWM policy statement (http://www4.uwm.edu/secu/docs/other/S47.pdf) summarizes and defines situations that constitute discriminatory conduct. If you have questions, please contact an appropriate SOIS administrator. Academic misconduct. Cheating on exams and plagiarism are violations of the academic honor code and carry severe sanctions, ranging from a failing grade for a course or assignment to expulsion from the University. See the following document (http://www4.uwm.edu/osl/dean/conduct.cfm) or contact the SOIS Investigating Officer (currently the Associate Dean) for more information. Complaints. Students may direct complaints to the SOIS Dean or Associate Dean. If the complaint allegedly violates a specific university policy, it may be directed to the appropriate university office responsible for enforcing the policy (http://www4.uwm.edu/secu/docs/other/S49.7.htm). Grade appeal procedures. A student may appeal a grade on the grounds that it is based on a capricious or arbitrary decision of the course instructor. Such an appeal shall follow SOIS appeals procedures or, in the case of a graduate student, the Graduate School. These procedures are available in writing from the respective department chairperson or the Academic Dean of the College/School (http://www4.uwm.edu/secu/docs/other/S28.htm). Report "INFOST 714 Metadata SYLLABUS Specifics in readings, schedule, and assignments will change each semester"